Morocco is a destination of choice for your holidays, so you can choose a heavenly holiday by renting a villa or an upscale riad. Live in comfort and luxury throughout your stay and experience staying in a property that has staff at your disposal and always ready to make your stay pleasant: cook, villa manager, driver, babysitter... a team at your disposal for you to spend the most relaxing holidays possible. 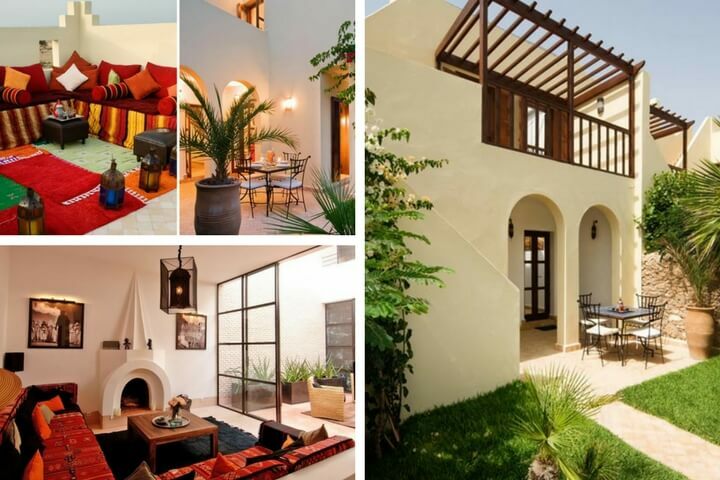 Among all the prestigious villas in Morocco, here is our selection of the most charismatic and luxurious houses. This sublime house at the foot of the High Atlas is the work of an architect and a landscaper who wanted to erect a contemporary house with clean lines, perfectly integrated into its environment. You will enjoy the comfort and the optimal elegance in this house with these airs of paradise. A cook is on site to make the dishes of your choice; traditional Moroccan cuisine as well as other dishes of your choice. Plus: the owner's dogs who live on site and who adore the company. With its roof terrace which houses a charming swimming pool ideal for cooling off is the magnificent Dar 118. Organised around a traditional patio, the property is perfect for summer holidays but also to enjoy during the months of September and October. In addition to an excellent cook ready to make you taste the dishes of your choice, the house has a hammam and a massage room which you can enjoy. This property is ideal for large events or holidays to many because it can accommodate 21 people in total. It is located on an absolutely sumptuous park of 5 hectares covered with olive trees, orange trees and palm trees. It hosts four beautiful houses that you can book in full exclusivity. The place is totally preserved, discreet and intimate welcoming a pavilion reserved for yoga, a spa, a tennis court, a private jogging track and gym. 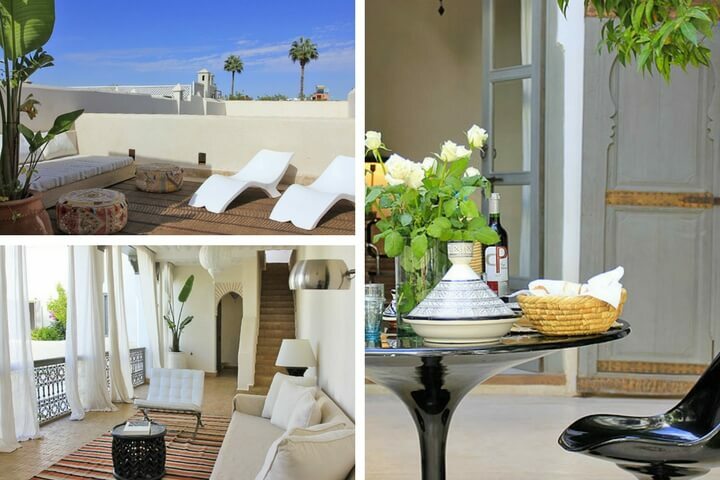 The Kaouki Riads are a set of six charming Moroccan style villas located in Sidi Kaouki, a small village near Essaouira. Only 100 metres away from huge sandy beaches, they enjoy a superb panorama of the coast and of the mountain. 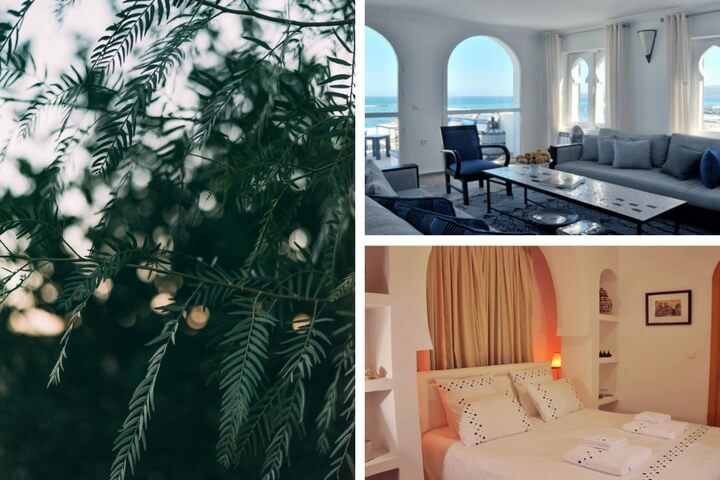 One can choose to be won over by the relaxing atmosphere of the countryside or to journey through the souks and ramparts of Essaouira, its excellent restaurants and shops. A perfect combination of luxury and privacy, this home is the perfect place to relax, whether you are a young couple, a family or a large group of friends. You will obviously have your own steam room to relax in the pure Moroccan tradition. This sumptuous Riad is located a few minutes from the Jemaa El Fna square, so this fully equipped house is a haven of peace and relaxation. You'll find large rooftop terraces that are laid out for lunch, dinner or a good time comfortably in the Marrakech sun. A chef is at your disposal so you can relax while enjoying the sun of Marrakech, without worrying about the hassle of everyday life. An elevator stops on each floor of the riad for the comfort of the guests, so come relax in this home of tranquillity and luxury without further ado. The house offers a refined setting in the heart of the historic city, open to the sea, with a clever mix of art deco and antique objects. Enjoy a panoramic view of the sea so you can relax during your idyllic holidays with family or friends. We must know that we offer Le Balcon rental in full exclusivity and we put pleasant and discreet staff at your disposal. This dream home of 10 hectares has many flagship aspects that will seduce everyone! Because of its size, you can gather with several groups of friends in this sublime property between artist's house and luxury villa. Your children will not miss a place to play and run around, without you being bothered. 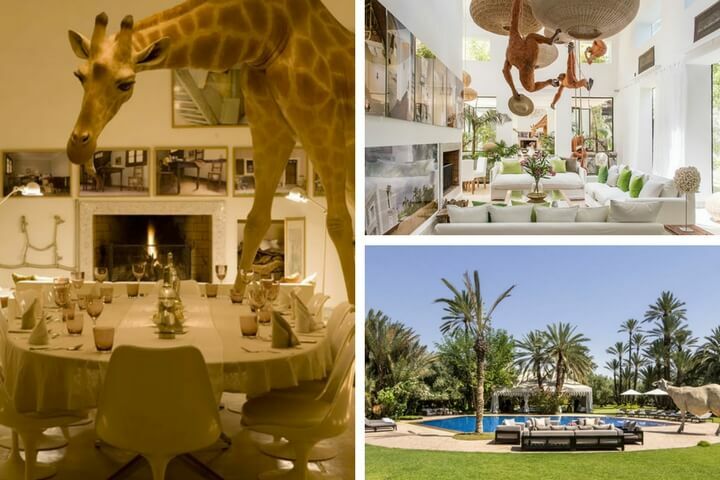 The originality of this high-end house is obviously its original decoration, with incredible animals in every room including the star of the house, the giraffe who is named Solange. 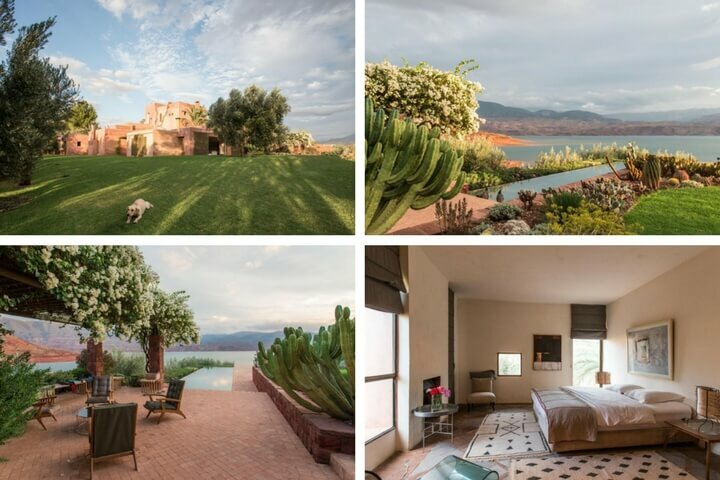 No wonder this sublime luxurious property belongs to Jean-François Fortou, the French artist established in Marrakech. The house has an efficient and discreet team, ideal to help you enjoy your stay, without you having to lift a finger.